The approach to the Billie Jean King National Tennis Center in Queens. I took my son to the US Open Tennis Championship in Queens on Friday. It was the first visit for both of us. We went to an evening match with Roger Federer playing against Sam Groth of Australia. I know that Anna Wintour, Editor in Chief of Vogue, is a big fan of Roger Federer (do I detect a bit of a crush?) so I suspected she would also be in attendance and I was right! I thought it would be fun to compare our very different experiences at the same event. Anna was right to bring a sweater. It was breezy and cool! Great minds: Anna and I both wore blue. 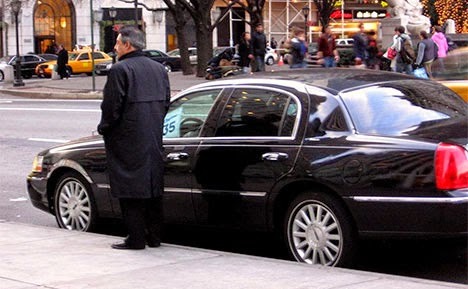 I am quite certain Anna took a town car (and driver) to the US Open. 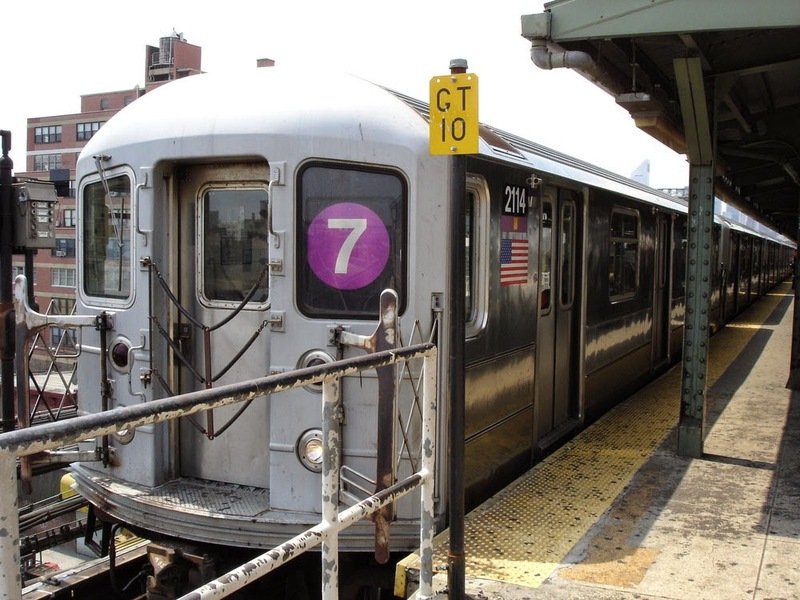 The 7 Train to Queens. 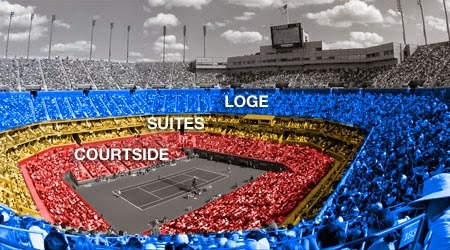 Anna probably sat in the red zone, courtside! What a fun crowd in the lower promenade! One thing we had in common was that we both had a great time! Groth prepares his blisteringly fast serve! 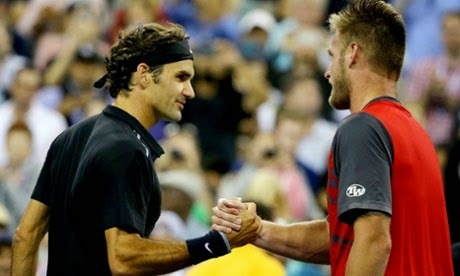 Roger Federer and Sam Groth shake hands after their match on August 29, 2014. Roger won, 6-4, 6-4, 6-4, in just under two hours. It was a lively match and, I have to say, easy on the eyes (from what I could see on the big screen) with such good-looking competitors. It was definitely Hottie vs. Hottie! Sam Groth’s serve hit speeds of 142 mph and up, regularly, and sometimes Roger even managed to return them! I’d heard the night games at the US Open can get rowdy (for tennis) and now I understand why. You take the energy of New York City, sprinkle a bit of alcohol on it (I saw plenty of people swilling champagne, mixed drinks, and beer as they walked around before the game! ), put it in a big stadium on a gorgeous late summer night, and add one of the best tennis players of all time? You got yourself one fun and sometimes loud crowd. The chair umpire had to ask us all to be quiet on many occasions! I hope Anna did the wave with us but somehow I can’t see it. Roger in a post-game interview. He is beloved in New York! 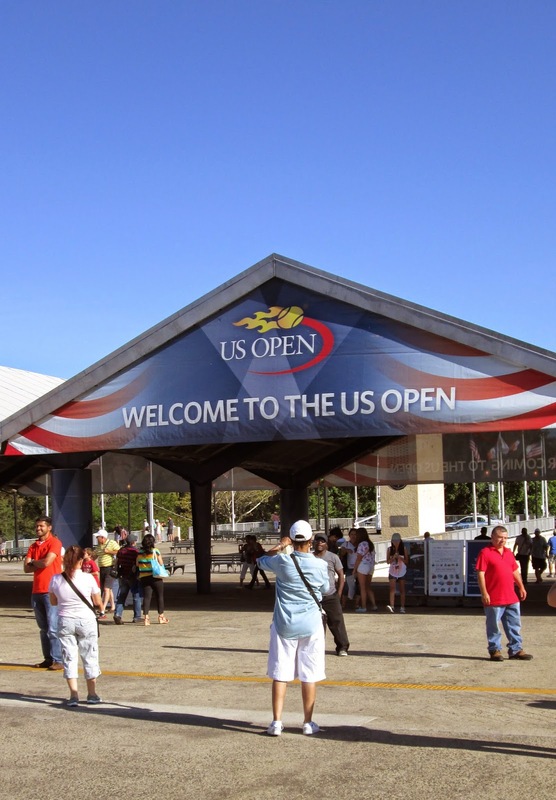 Let me know if you have ever been to the US Open and if you have, what you thought of the event! I've never been to a pro tennis match but would probably prefer to watch the ladies....especially a hottie like Sharapova. Technology has ruined men's tennis as such ball speed has greatly reduced volleys and therefore skill and drama. Tennis, gymnastics, and figure skating are the sports where the women put on a much better show than the men. Oh GSL I love that you are so opinionated and share those opinions with me! I still love watching the men in all the sports you mentioned! And I still get goosebumps thinking of Evan Lysacek's gold medal winning performance at the Vancouver Olympics. He was just so good! As for the Federer/Groth match, Sam could only get those 142mph aces in every once in awhile, the serves that actually resulted in a volley were more in the range of 119 or less. And for all Sam's serve speed, Roger had his number. He is such an elegant player and I really felt he had control of Groth from the beginning. It's amazing to see professional tennis in person. I had an Anna moment also at a US Open, but with a different Anna. Saw Anna Kournikova, play a long time ago - I think 1996 at the US Open in Forest Hills. Since I had an end seat & she & her security passed right by me,I get a close-up look, She was young and gorgeous - of course, still is. There were a lot of celebs there - Patti Lupone sat in front of me with her son. My seats were just ok, so I was a little surprised were sat in the same seating section. She was starring in Master Class on Broadway at the time. very expensive. And I kept wishing I was in the shade. But it was an exciting day & I can still remember it. Love your cobalt blue nautical tee - is it from J. Crew? Hi Rosie! I can't believe it took me so long to finally make my way out to the US Open. My son and I had a great time! I'm so glad we did not have tickets for today. I heard on the TV broadcast that the line for the water fountains was longer than lines for the bathrooms! You are right, the food and drinks are so expensive. We ate before we got there so I didn't have to spend too much money. I didn't realize it would be a whole scene with all the dressing up and the champagne and mixed drinks. I have never been to a sporting event where women spectators wear such high heels! Patti Lupone right in front of you! That would have made my whole night. She is a legend! So funny that you and Anna chose the same colors! I love Hottie vs. Hottie any day!